Wrapup: Seventeen MINIs showed up at Krispy Kreme for donuts and little hangout time. We took a short drive through the scenic Riverside area, and spend the rest of the day at the Zoo. Here are pictures from Francis. Here are some pictures from Becky. UPDATE: 04/10/2006: We will be meeting at the Krispy Kreme Donut shop at 5640 South Harlem, Summit Il. We will make our start time at 9:15 to be able to take a short drive through the Riverside area on the way to the zoo. Help celebrate Earth Day on Saturday April 22nd by hanging out at the Brookfield Zoo!! We will be planning a meetup and short drive in before the Zoo opens. Due to the location, the drive will not be quite as involved or as exciting as our last drive. WHAT: Meetup, short drive and a day full of hanging around Brookfield Zoo. WHERE: The meetup location and short drive are not planned yet, keep an eye here for details as the event gets closer. DETAILS: We will hold tickets for the first 60 requests, and distribute them when we meetup for the short drive. If more people are interested, you are free to join up but will have to pay the normal admission rates. Please send me an e-mail, or respond to this post and let me know how many tickets you would like. 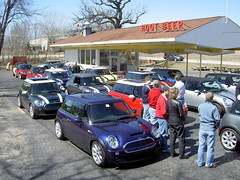 Over 30 cars showed up at the start of the Spring Drive Poker run. We wandered around a bunch of fun roads in the northwest suburbs and eventually made our way up to Lake Geneva. At each stop, drivers were presented with a poker card and directions to the next location. We managed to make the entire drive without anyone getting lost (by very much). Poker hand winners Rich and Conrad won a MINI model car donated by Historic Race Car and a MINI Zymol detailing kit from Detailing Concepts. After a nice lunch, a handful of us took a couple loops up and down Snake Road. A good time was had by all. If you have pictures posted from the drive, send me an e-mail, and I will include the links!! Here is some more autocross information. The Chicago region of the SCCA runs a series of autocrosses in the Chicagoland area, many in Joliet. Check out the schedule Here. The Tri-State Sports Car Council runs a number of events in Milwaukee. Here is their schedule. Take your MINI's out and have a bit of fun in the twisty bits. Steve from the Midwestern Council Sports Car Clubs has invited members of our club to participate in their Time Attack/ Autocross at the Autobahn Country Club's North track on April 8th. 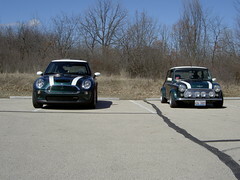 Get your MINI's all cleaned up for our Spring Drive, Sunday March 26th!! This year we will be doing a Poker Run starting in Schaumburg, and finishing with a late lunch in Lake Geneva Wisconsin. Where:Start is in the Ikea Parking lot, 1800 E McConnor pkwy Schaumburg Il 60173 finish in in Lake Geneva. We will drive rain or shine (or snow). Please post here or shoot me an e-mail if you are interested in attending, so we know how many people to plan for. 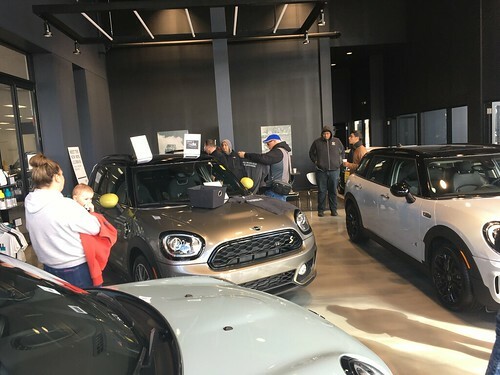 As we are moving towards completing our 3rd year, we have recently passed membership number 200 for the Chicago MINI Motoring Club!! There are a bunch of February memberships and renewals that will be going out within the next week. We are waiting on a set of newly designed Club stickers to arrive. Congrats to new member Steve J. for drawing lucky number 200!! Don't forget to add yourself to our Club Frapper Map if you choose, to show where you are from (by zipcode).